I know that I’ve lived in Cambridge since I was a child, but, honestly, it doesn’t interest me that much. Visitors might find it beautiful and feel the urge to snap photos incessantly, yet I find these people far more interesting than the things that they’re attempting to capture. Saying that, I have taken some images that I feel really capture Cambridge as I know it – of them this is by far the best. 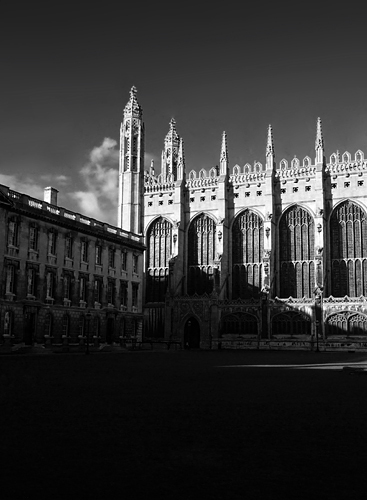 For those of you not versed in Cambridge Architecture, this is Kings College Chapel, Cambridge, UK, from the inside courtyard as you come in from Kings Parade. I really like this picture because it is crisp, it isn’t what you get on the post-cards, and yet it still encapsulates something about the College that is otherwise very difficult to describe. Who knows, maybe I’ll try to get a better pic next time. Until then, this’ll have to do.